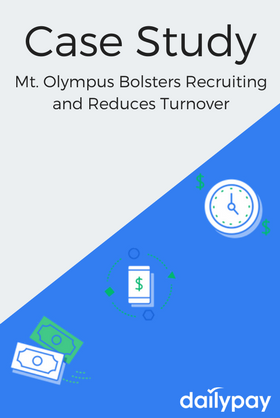 This case study about Mount Olympus Water Park and Theme Park Resort details how the company was able to bolster its recruiting efforts and reduce employee turnover. Fill out the form on the right to view it immediately. DailyPay, Inc. is a financial solutions company dedicated to reducing employee turnover by improving the financial lives of employees. Employees can receive their wages days before their scheduled payday at no cost to your company or change to your existing payroll system.